The Fuente family’s knowledge of tobacco stem from old world Cuba in the nineteenth century. Born in 1887, Arturo Fuente practiced the art of growing high quality tobacco under the watchful eye of his father. In 1906, Arturo immigrated to Florida where he rolled his first cigars in America. The Fuente family eventually moved to Ybor City. At that time, Ybor City was the cigar capital of the world. In 1912, Arturo rolled the first cigars bearing the Fuente family name. Today, under grandson Carlos, the family owned factory employs approximately 2500 employees in Santiago, Dominican Republic. And the legend lives on…. The medium bodied Gran Reserva Rothschild Natural has a mild spice present at first with notes developing into cocoa and cedar. The flavors continue to remain constant throughout the stages but with an increasing amount of spice. The toothy, toasty Cameroon wrapper, along with sweet Dominican Filler, provides a mellow smooth smoke. 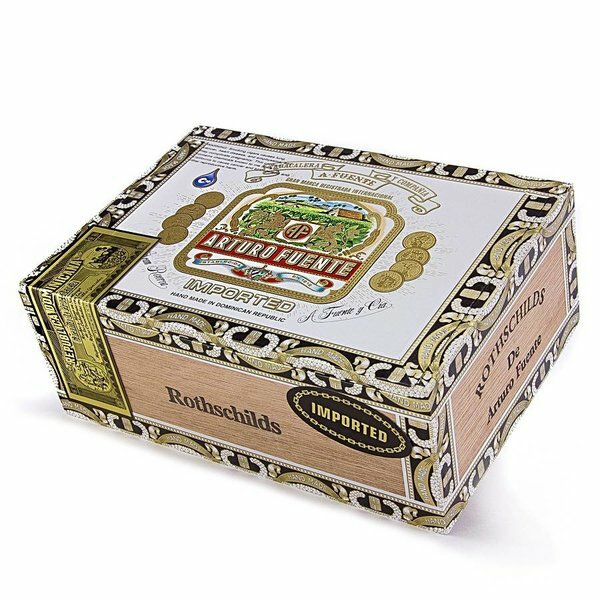 The Gran Reserva Rothschild is a little, fat cigar which appears way more elegant than it costs. Available in a cedar chest of 25, Gran Reserva is a great cigar to share if you want to impress. You will impress yourself by purchasing these cigars online from elcigarshop.com at a great price. I paired my Gran Reserva with an English-style Brown Ale from Tampa’s Cigar City Brewing Company. Their Maduro Brown Ale is a little high in alcohol content, but has a rich malty flavor which helps to dial it back. The mild to medium bodied Gran Reserva Rothschild, with its toasty assets, paired very well with the malt. Delish!